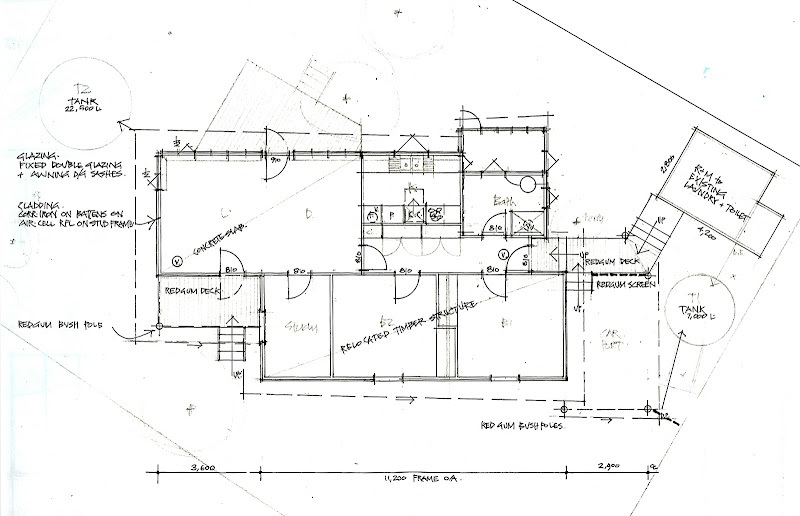 As part of the building permit application process I needed to get an Energy Assessment of the house design. The architectual drawings were submitted to an Accredited Rater who uses House Energy Rating tools like FirstRate to give an energy rating to a house. In Victoria any new house or renovation needs to receive a rating of 5 stars or better in order to be appoved by council. The house design received an Energy Rating of 6 stars, the maximum rating available with software used. With the plans a list of design details was also supplied which help to elaborate on the drawings which is listed below. The development includes the relocation and rebuild of an existing 3 room timber structure (to become 3 bedrooms) with a new construction of Living/Dining/Kitchen plus Bathroom. The Living/Dining/Kitchen is an open plan design with thermal mass from the insulated concrete slab. This area has seals to external doors, and an airlock through the main internal traffic area. Bedroom 3 has a door seal. Generally- a plywood box beam structure with “sprung” corrugated iron roofing. The roof space is 450mm deep, and has 2 roof ventilators. The RFL (reflective foil laminate) is AirCell Glareshield fitted under the timber battens to ensure effective reflective capacity (min. air space 45mm). There is no thermal bridging between roof iron and RFL. Ceiling insulation is R4.0 polybatts, fitted in 2 layers to ensure no edge gaps in laying. External walls are all timber framed 100mm nominal. All wall cladding is corrugated iron fixed to timber battens fixed over AirCell RFL onto studs. Again, a guaranteed minimum air space of 45mm is established (allows summer heat to discharge vertically). Wall batts R2.5 Polybatts fitted between studs. Internal lining is 9mm plywood (perhaps another R0.5?). Doors and windows to the Living area have draft seals. Bedroom windows do not. Windows to the Living/Dining/Kitchen open area are all double glazed (12mm airspace, argon gassed, Low-E external glass). These windows are fitted with pelmets. All other windows are single glazing only (some laminated, e.g. greenhouse). All windows are planned to be fitted with curtains. Window frames to be made from timber. Concrete slab-on-ground to Living/Dining area has an area of 30m2. This is a raised slab (Urban Flood Zone overlay) with 15mm styrene board edge insulation from the base of the strip footing (500 below GL) to within 75mm of the Floor Level (75mm termite inspection area). The styrene board is externally protected by a layer of cement sheet, to avoid physical damage. Timber floors are enclosed to restrict (but not eliminate) sub-floor air flow, and are all fitted with a RFL of AirCell Permifloor 500. The product information suggests an enclosed timber floor can exepect a R 1.6 for heat flow in, R 3.0 for heat flow out (winter). An Edwards 300litre gas boosted solar hot water service is proposed. This is located on the north facing 30o elevation roof of the Bathroom/Greenhouse. This is close to hot water demand areas. All rainwater is collected on site. Tanks T1 (7,000litres) and T2 (22,500litres) are shown on the Floor Plan. A further tank of 22,500litres is a possibility after reviewing rainwater collection patterns over the coming 5 years. Tank T1 is proposed on a brick tank stand with a cellar underneath. This cellar will have a floor 1.5m below Ground level. The above ground walls portion will have ventilation louvers, and these covered in vines within the first year (evergreen). The vines will filter the air flowing through. A 400mm air duct will connect the base of the cellar with a Food Cupboard in the Kitchen. This will allow cool air to feed the cupboard, and then to a roof ventilator. This will allow cool storage for fruit and vegetables (reduction of Frige load). The refrigerator is located in a recess with a bulkhead, vented to the roof space for heat discharge in summer. A manual vent control (flap with cord) is in the kitchen. All stormwater is retained on site and discharged into swales to allow local wet spots of different food production. A worm farm attached to a reed bed will treat all grey water on site. The discharged liquid will feed the existing (and proposed) fruit trees. Existing deciduous trees on the north provide winter solar access and summer shade. Additional deciduous fruit trees are planned to the west. Deciduous vines are also planned for summer living area shading (north pergola to deck). The immediate power supply will be the existing mains connection. An option of grid-connected PV power is a serious future consideration (so not in this assessment). A small gas space heater (wall vented) will complement the passive solar heating. The dwelling will not need any air conditioning. Pedestal fans will assist air movement in very hot weather. Good cross ventilation will allow doors to be lefy open for cooling assistance. Fly screens to doors. ENERGY RATING is an index of a building’s thermal performance (i.e. heating and cooling requirements) for residential homes in Australia. House energy rating through the Nationwide House Energy Rating Scheme (NatHERS) uses computer simulations to assess the potential thermal comfort of Australian homes on a scale of zero to 10 stars. The more stars, the less likely the occupants need cooling or heating to stay comfortable. 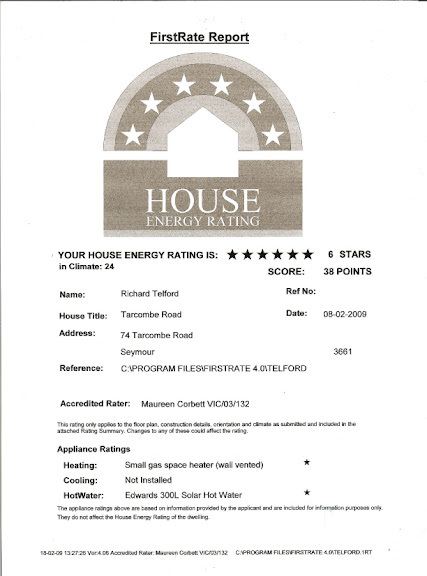 6-Star energy rating is taking effect in Western Australia on May 1st 2012. The new 6 star energy efficiency regulations are the biggest challenge for builders and architects since the Energy Efficiency regulations were first introduced into the Building Code of Australia (BCA) in 2003.